Recipes to Make Special Typical Italian Spaghetti .Serving dishes typical of Europe, especially Italy are much favored by domestic residents other than pizza is spaghetti. Spaghetti is a food dish in the form of noodles presented with a scrumptious sauce mixture. Unlike the instant noodles that often we enjoy, spaghetti noodle texture is more chewy and not easily broken. 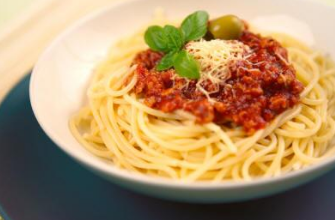 For those of you who love the food dish of noodles, this Italian-style spaghetti you can try to patch an empty stomach serve you at the time of rumbling. Material and methods of manufacture can you see in the recipe to make spaghetti Italian specialties below. Pour water into a pot that is already stored on the stove and turn on the stove and let the water in a pan of hot and bubbling. Then add hot water in a saucepan with 2 tablespoons vegetable oil / cooking followed by adding the sausage / ground meat (chicken / beef), oregani powder and instant spaghetti noodles that have been packaged in a wrapper. Stir the noodles spaghetti expands and all the ingredients are mixed in a pan cooked. Further lifting spaghetti cooking results and then drain the water from boiling moment to be reduced. Meanwhile prepare the chilli sauce pans and download / your favorite tomato sauce and tuangka aforementioned prepared skillet and then pour the spaghetti noodles that had been drained. Stir until spaghetti noodles and sauce is well blended. After that, move this spaghetti noodles into plates or bowls and serve immediately. Spaghetti dish taste delicious Italian-style has been created and the time to enjoy this spaghetti while still warm in order to better taste on the tongue. 0 Komentar Untuk "Recipes to Make Special Typical Italian Spaghetti"